You are responsible, logical, norm-following hard workers, strategic, organized and possess natural leadership qualities. You trust facts and experiences more than theories. You are master coordinators that can effectively give direction to groups. You are decisive, loyal, tradition observing individuals, value knowledge, efficiency and competence. You enjoy being the person in charge and often make good supervisors. You are outspoken and will not hesitate to speak of your plans for improvement. You make decisions based on logic, it allows a person to organize and categorize things, thoughts or arguments. It is the ability to see the logical consequences of actions. It follows sequence and organization. However, your natural bluntness and honesty can causes you to sometimes say hurtful things, you can be extremely dominating and controlling, you can have bad tempers and get angry easily, you make decisions very quickly, sometimes with no real data to go on. 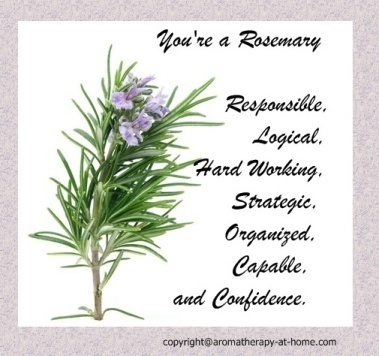 You can use rosemary essential oils (Rosemarinus Officinalis) for these positive attributes: energy, confidence, creativity, clarity, structured, concentration, stabilized, sincere, and aware. Also to counteract these negative attributes: loss of memory, learning difficulties, lethargy, overworked, overburdened, strain, emotional exhaustion and indecision.